These are interesting times in Tuscany. There is no doubt the region is in the midst of a profound stylistic evolution. A growing number of estates are moving in the direction of more natural viticulture. In the cellar, new oak is down and the use of neutral vessels is up. Cement, once virtually forgotten, is making a huge comeback. As it turns out, the makers of cement tanks and vats are now taking as long as six months to fill orders, something that was unheard of up until very recently. In Chianti, Sangiovese continues to gain favor, while the use of international grapes in Tuscany’s most famous wine has decreased. Readers will find three very different vintages in the market; the cool, powerful 2010s, the radiant 2009s and the irregular 2008s. As always, Italy’s byzantine regulations can be intimidating for those who don’t yet feel comfortable with the wines. Readers who take the time to get to know the producers in this article will be rewarded with a number of stunning bottles at all price points. I tasted the majority of the wines in this report during a week I spent in Tuscany in April 2012, followed by tastings in New York shortly thereafter. The 2009s are wines of contrasts. The winter and spring were on the cool and damp side in most parts of Tuscany. In some spots flowering got off to an early start, as temperatures were higher than normal in May. The summer was very hot, culminating with an intense heat wave that arrived in mid-August. This is the time when evening temperatures typically begin to moderate as the summer winds down and fall arrives. Not in 2009. The worst of the heat lasted over a week. I have a vivid recollection of that time because I was on vacation in Tuscany with my family. It was hot, hot, hot. The most adversely affected area was Maremma, where I came across a number of wines that had their personalities baked out by the heat. Chianti Classico, which is generally cooler, was spared the worst of the heat. In some places, the warmth actually helped fill out some of the wines. A number of producers did not bottle their top wines in 2009, and many of those who did were very severe in their selection of what made it into bottle. It is hard to make a broad generalization about the 2009s given the sheer size of Tuscany, but in general it can be said that the wines tend to have medium-bodied structures of cooler vintages, but radiant fruit typical of warmer years. I don’t expect this to be a vintage to cellar over the long term, but it should be a useful crop of wines to drink while the 2006s, 2007s and 2008s come around. Overall, I find much less personality in the 2009s than I do in the surrounding vintages, although, as always, I prefer to choose producer first and vintage second. In Chianti Classico, 2010 is shaping up to be a great vintage, perhaps one of the greatest. 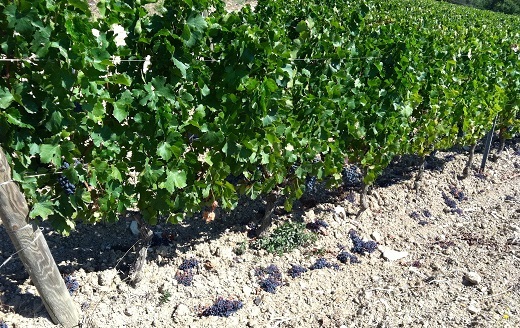 It was a cold year, with an irregular flowering that lowered yields, and a very late harvest. The wines possess stunning depth, well-delineated aromatics and massive structure. If I had to draw comparisons with recent years, I would say the 2010s have the aromatics of 2004, the fruit density of 2007 and the structure of 2006. Sounds pretty appealing, doesn’t it? Readers can get a sense of the year by tasting the Chiantis that are entering the market over the next few months. And it’s not just the Chiantis from the Classico zone that are terrific, there are plenty of wines from the broader Chianti zone that are also compelling, especially because they can be had for a fraction of the price. I am equally enthusiastic about the wines of Montalcino, as I described in Issue 200. So far, I have tasted less from Maremma, but what I have seen is promising as well.